For the last week I have been in storyboard mode for a large course I am creating. Since grad school I have been using the same format for storyboards, when I do use them. Some projects benefit from use of storyboards, some do not, but that is another post. The storyboard I use is a very simple, but flexible format that we used in my school's ISD program. I have made a few small changes to it. Here is the template, which is made in PowerPoint, but could easily be made in MS Word too. And here's what I include in my storyboards. Screenshot or representation of animations, interactives, etc. Any pertinent notes that don't fall under "Navigation" of "Media"
Color requirements, screen size, graphic sizes, etc. At the moment I am busy storyboarding a course. So, here is what I would like to share today...a great video about the history of storyboarding, how it is done in the film industry, and its benefits. Please pay attention because much of it translates to what we try to accomplish in e-learning. Dale Rankine recently launched the first video of his video training series for Flash mobile developers. 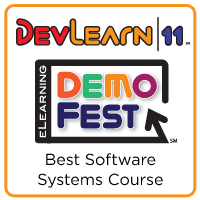 If you are interested in developing with Flash Lite, say m-learning, you will want to check this out. The videos are developed for delivery on Adobe TV, but he is also making them available on Vimeo. Here the link, http://vimeo.com/adobeflashlite. I am looking forward to seeing more of these videos and will be adding this to my Free e-Learning page, of course. The latest e-Learning Guild e-book has just been released. FYI: All their e-books are free. It includes 54 Tips for Selecting e-Learning Service Providers, 44 Tips for Working Successfully with e-Learning Service Providers, and an article by Evelyn Jackson, "Improve Outsourced e-Learning Quality with Consistent Standards." It was announced today that Verizon and T-Mobile are offering Motorola smart phones based on Google's Android operating system. These will be available later this year. T-Mobile already offered one phone with Android, the G1, and will have the My Touch 3G during the summer. Will these new Google Androids have Flash? 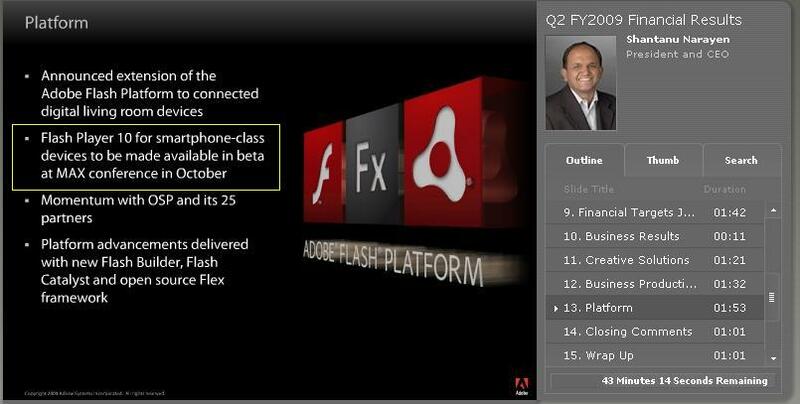 Well, according to Adobe's 2nd quarter earnings call, they are releasing Flash for smart phones (Flash 10) this October. And it is expected to be on Androids. If Android phones have Flash, they will have at least this edge on Blackberry and iPhone. This includes the ability to deliver m-learning created with Flash. I just can give up on using Flash/Flash Lite for delivering m-learning. I saw today that MasterCard launched Learning Centres, which provides financial management tips for consumers. Are they doing the same here in the USA? I found they have a learning center on the U.S. site. And they have a DIY Guide for Young Adults. However, it markets their cards as much as it provides financial advice. Full disclosure, I am employed by a financial institution, but I am also an advocate of financial education/literacy. As we has seen far too much of, people who are not up to speed with how personal finances, credit cards, and banking products work can get into extreme jams to say the least. And they are also easily taken advantage of . So, here are some resources provided without any marketing from financial industries. And to quote Shakespeare, "Neither a borrower, nor a lender be." I signed up for Delicious social bookmarking quite a while ago, but it just didn't take for me. Perhaps the fact that I could not access it at work or that I was perfectly happy with using my browser for bookmarking. Either way, I set-up Delicious and just never really used it beyond the first few days. Why not give it another try. After all, I am trying move more onto the cloud, I can have my bookmarks in one place and I can share sites that I value. Let's hope my new job does not block Delicious. I will find out tomorrow. Easy access from any computer, if Delicious is not blocked by the "man" at work. So, I started with bookmarking and tagging the links I have collected on my Free e-Learning page and added a few blogs, blog communities and some e-learning resources. And here is my Delicious tag cloud. FYI: Here is a great video on social bookmarking and Delicious. I am sure there are additional features on Delicious that I should be using. Let me know what Delicious tools and features you would recommend. Has the economic struggle had a positive or negative impact on online learning? This question has been posed a lot on the e-learning blogs, for example. Here are quotes from the article that pertain to distance learning, social media, cloud computing, and mobile technology. Government stimulus funding has been creating new opportunities in education and energy, says Clark Waterfall, a partner at Boston Search Group. "We're seeing activity in for-profit education companies, and companies geared to distance learning and corporate learning,"
A new role at many companies is a social media expert, who can help the company communicate with customers and prospects using new channels like Twitter, Facebook, and blogs. "Sometimes that job is called 'community manager' or 'community rep,' " says Tom Summit of Rowley-based Catalyst Recruiting Corp. "But the people who can get hired are the ones who can relate online activities to quantifiable metrics. What are you doing for the company, aside from just starting a blog?" Cloud computing - technology services that can be accessed over the Internet - is another area of increasing activity. "I also see a lot of interest in search engine marketing" - making websites more prominent in search results - "and engineers who know how to design websites with that in mind," Summit says. Keith Cline of Dissero LLC says one position that can be hard to fill at the moment is a mobile application developer. "If a company is trying to build an app for the iPhone, there aren't a lot of people who have that experience," he says. It is good to hear that there are opportunities out there in the fore-mentioned fields and probably more to come. From my own glances at job boards it appears companies are still hiring people in the distance learning field. Moodle is getting more and more popular, but just how big is it? I am even starting to hear of more corporations adopting it. My experience has been that companies were weary of using open source software, but that appears to be changing too. I decided to do some research. Here is what I found from Moodle.org. Keep in mind, these are only the registered Moodle sites. Pretty impressive numbers! Here is a great video on what it would be like to descend into a black hole. Yes, I am an astronomy nut and I love educational videos/animation. Plus, it comes from my alma mater, University of Colorado at Boulder. So, when I saw this video and the great stuff coming out of Jila at CU, I had to share it. The video contains insets that include a map of the trajectory and a clock that displays the time left until central singularity, where space and time come to an end. In e-learning central singularity is 1 continual hour of clicking next buttons. Had to throw that in. Here are all the details of the science behind this video - http://jilawww.colorado.edu/~ajsh/insidebh/schw.html. OutStart has announced a merger with Hot Lava software. OutStart produces an LCMS and development tools (including TrainerSoft, which was renamed OutStart Trainer). It will be interesting to see where this goes. There are many challenges to m-learning. The ease of getting handhelds to talk to an LMS is one, I am sure they will be getting this down pat with Hot Lava and their LMS. If done well it may even give them some advantage in the m-learning world. So, here is what they get by buying, I mean merging, with Hot Lava as stated in the press release. OutStart will make use of Hot Lava’s patent-pending technology to develop, deliver and track mobile content for everything from product training to assessments, surveys, job aids and checklists. OutStart plans to incorporate Hot Lava Mobile capabilities in its social business software and learning systems as well as offer Hot Lava Mobile as a stand-alone solution. This will be interesting to follow and see its impact on the m-learning world. There are some great e-learning courses out there for kids. I had a few courses on the Free e-Learning page, but hidden under Misc. I am well overdue to add a K-12 category on the Free e-Learning page. For me, some of the most engaging and inspiring online learning is designed for K-12 students. As a corporate trainer, I am often inspired by what is done in K-12 programs. And much of this inspiration has led to much more fun, engaging and instructionally sound course's for my audience. This includes use of educational games, cartoon characters, immersive simulations, humor, etc. So, thank you to all the K-12 course designers out there. And thank you Christy, Experiencing E-Learning, who suggested that I add Edheads.org to the list. I have always relied on the kindness of bloggers. If you know some courses that I should add, just let me know. My Free e-Learning page has received a consistent number of visitors since adding the page. The page receives approximately 10% of my blog's hits. And from my blog stats, I can see many are launching the free courses. My intention for the page was to not only provide educational opportunities, but also to showcase examples of e-learning. Many of us, myself included, are inspired by seeing what other e-learning professionals are creating. And I am happy to see the page is being attended. So, with the intention of increasing the value of the page I have added an "Instructional Design" category. If you know of any courses that will add value to this category or to the Free e-Learning page in general, please let me know.